Curd Face Pack For Skin Whitening. There are many home remedies one can churn out using curd along with various other easily available ingredients. Few of them are listed below. Honey and curd when combined together make an exceptional natural moisturizer that hydrates the inner layers of the skin, making it squashy and lustrous. It also helps to lighten the skin and get rid of tan that causes wrinkles and acne. This gram flour and curd face pack for skin whitening works best for those with sensitive skin. It cleans the surface of the skin and prevents acne and pimple causing bacteria and fungi. It also helps in getting rid of blemishes, hence lightening the complexion. Lemon is packed with the goodness of vitamin C that helps in keeping the skin healthy and clear off pimples. It also helps in boosting the collagen production in skin, making it bright. Use curd for dry skin through this pack and you will see how it moisturizes and hydrates in the long run naturally. Turmeric is an excellent antiseptic, antioxidant and anti-bacterial agent and hence using it for skin care regularly can enhance the skin color. Regular application of turmeric along with curd for skin can bring a radiant glow to the face. Use this face pack with curd and turmeric for fair skin and smooth texture. Corn flour helps in restoring the skin texture and gets rid of the tan as well. Use corn flour and curd for skin whitening through this pack which also soothes and moisturizes the skin. Oats are known to be the best exfoliants that helps get rid of dead skin cells and follicles. Oats also help in healthy growth of new cells and removes blackheads. This oats and curd face pack for oily skin can make it acne free as well. Oats can also be crushed and mixed with curd and scrubbed on the face for 10-15 minutes to get the same glowing and clean effect on skin. Tomato is also a great de-tan agent and along with curd helps in keeping the skin away from free radicals. Being slightly acidic in nature it also helps to balance the pH levels of the skin. Cucumber is an extremely hydrating ingredient that helps keep the skin soft and supple. We can drain off all the water from curd to make it into a yogurt and use it along with cucumber to get a clear and clean skin tone. 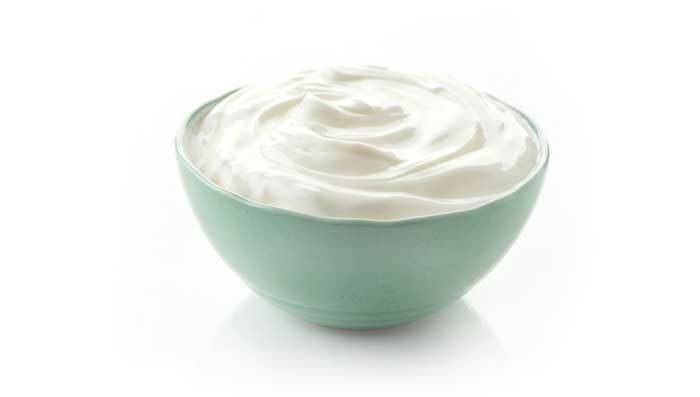 One can also use yogurt for skin for an equally effective baby-like skin. Use yogurt for oily skin through this face pack which is extremely effective to remove tan and signs of aging in skin. Potato helps in lightening the skin complexion and yogurt moisturizes and soothes the texture. Fuller’s Earth of Multani Mitti keeps the skin clean by absorbing excess oil, maintaining a balance. It also improves the blood circulation and nourishes the skin from inside. This multani mitti and curd face pack for oily skin restores the lost glow instantly. Taking care of our skin seems not just very daunting but a tricky task as well. There are many remedies that claim to bring back the joy of feeling soft and beaming, but they hardly work. Just try out the above mentioned simple steps and feel the difference within days.